Saturday, June 8 will be our third annual Feminist Scholar in Residence event. The Rev. Dr. Cristian De La Rosa will lead us in learning about mujeristatheology and its application to today’s world issues. Want to know more and/or help plan this event? Please come to the next meeting of the Gender Equity in Word and Deed Committee in the North Room from 7:30 to 8:30 pm tonight, Thursday, April 11 . All are welcome. 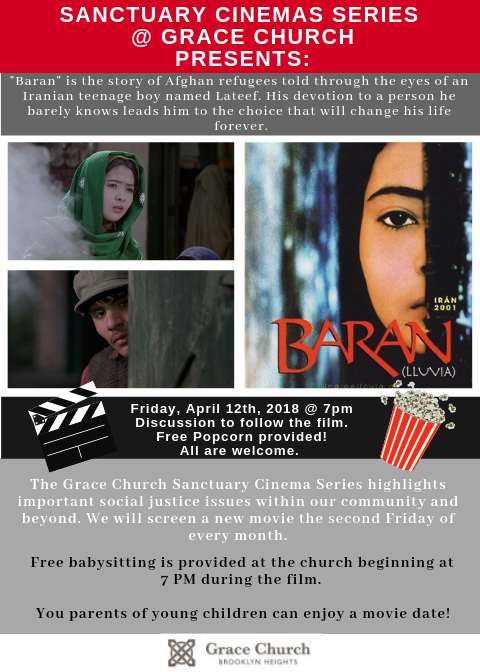 Please join us for our next FREE Sanctuary Screening, this Friday, April 12 at 7 pm in the Guild Hall, when we will be watching Baran . FREE babysitting is provided at the church, beginning at 7 pm, during the film. You parents of young children can enjoy a movie date!!! Are you/your family from another country? 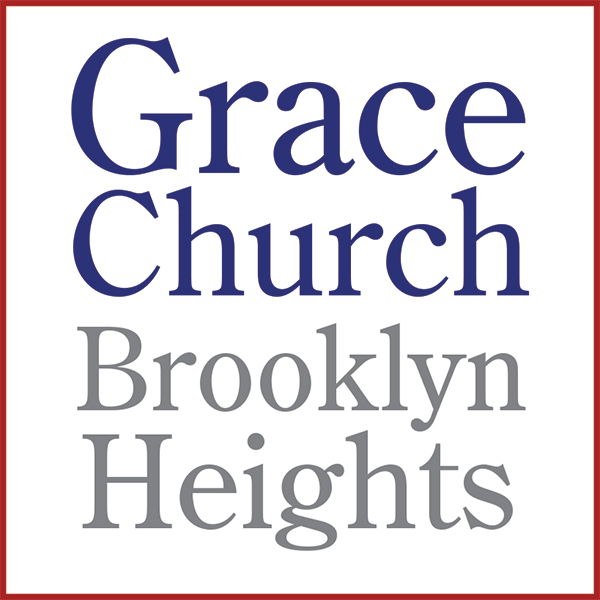 Grace Church wants to celebrate the international diversity of our congregation with an inaugural Multicultural Day in October 2019. There will be food from around the world, artifacts and pictures on display from various countries, music and entertainment, children’s activities and much more!! If you are interested in planning and/or participating in this event, please join us for a meeting on Sunday, April 14, 10:15 - 11:00 am in the North Room . For more information, contact Denise Farrell or Allison Robinson . During the solemn season of Lent, all is restrained. The music…. the altar flowers…. even the alleluias go missing! 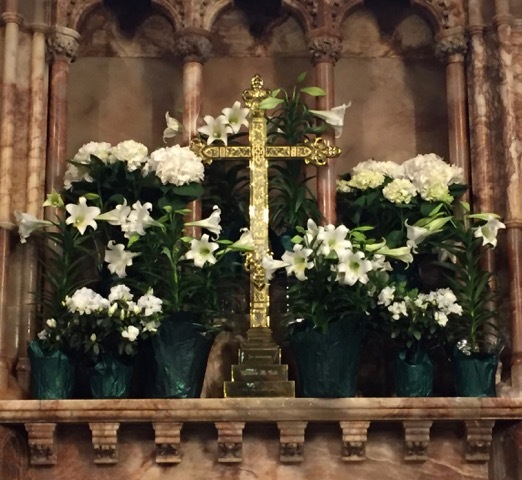 The explosion of flowers for Easter Sunday is part of a joyous celebration. 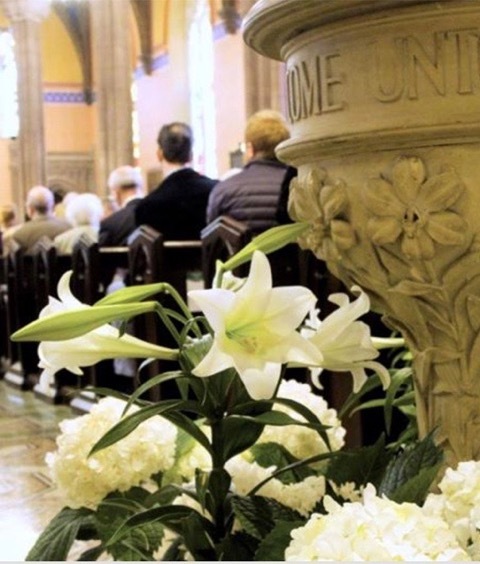 To prepare, we will be placing pots of lilies, azaleas, hydrangeas, tulips and daffodils throughout the Church and Guild Hall. 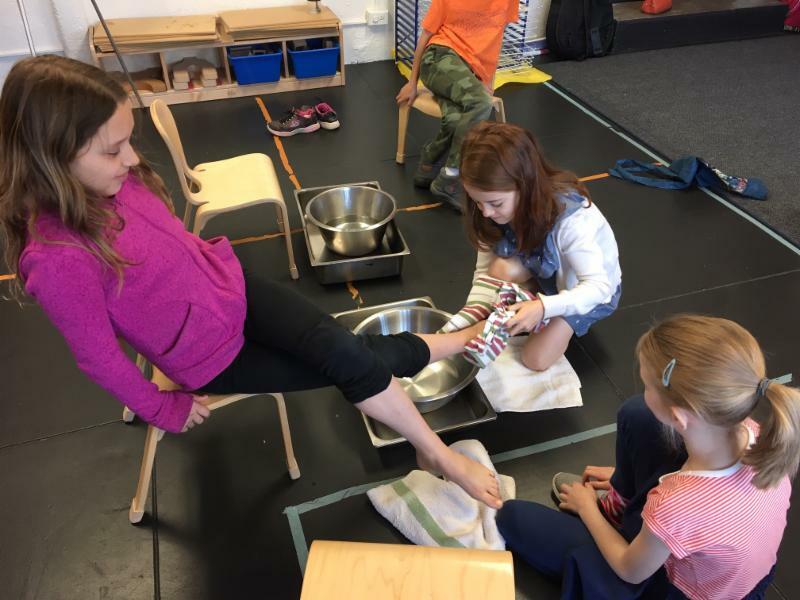 If you’d like to help with this special activity, please contact Kate Rock or Leslie Keiler . Who are we as a church community? What are we called to do? This is an exciting time of transition and growth at Grace, and we need your help to deepen our understanding of the core values that underpin Grace’s mission and our vision for the future. 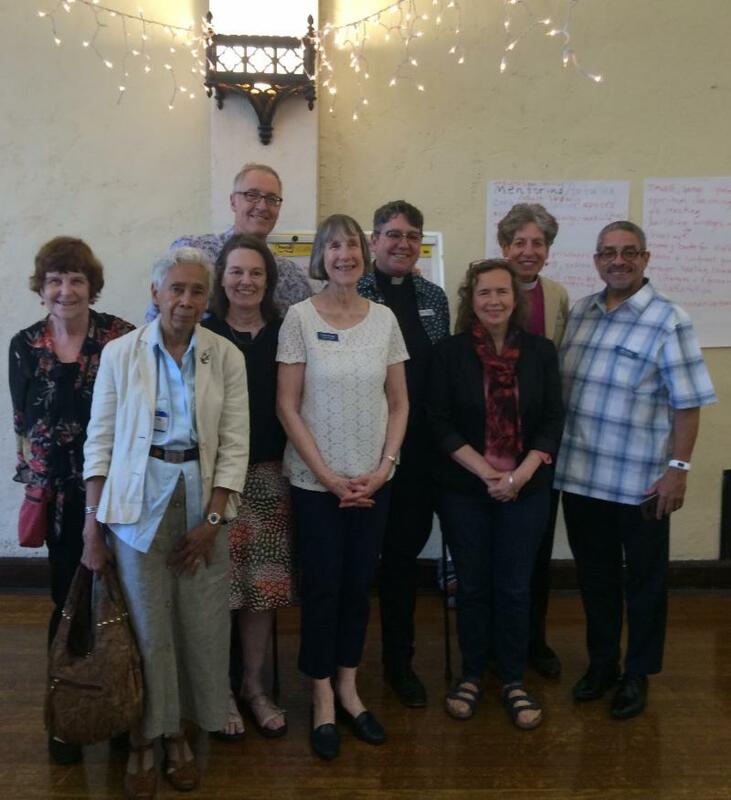 Members of the vestry will be inviting parishioners to engage in conversation about Grace’s core values and mission. Please be receptive if you are called or approached at coffee hour to chat for a bit. You may also contact Amy Rowland directly if you are interested in participating in this dialogue. 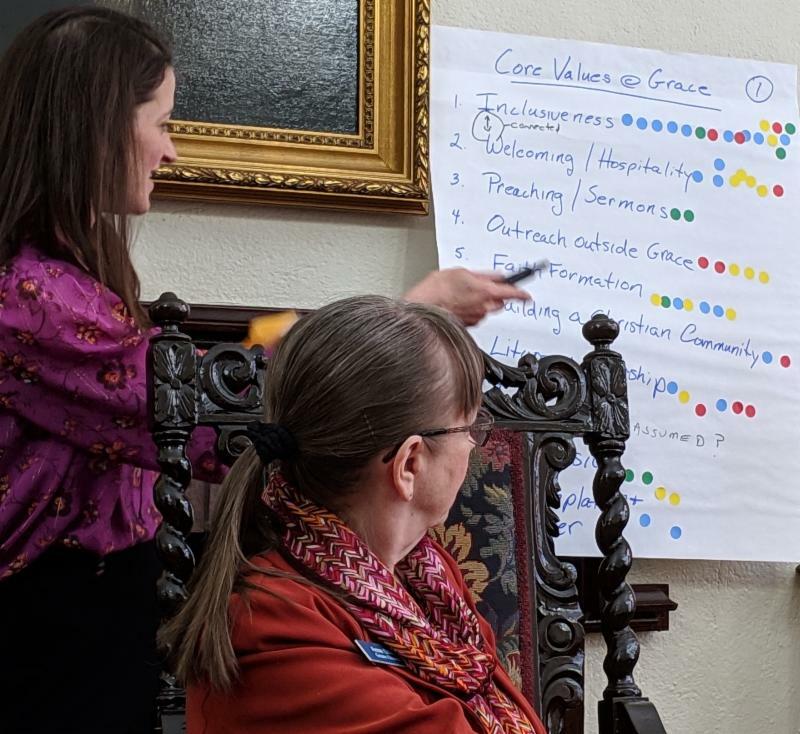 In addition, the vestry will be facilitating a series of focus groups about core values - the next one will be held at 10:15 am on Sunday, June 9 in the North Room and we encourage everyone to attend . We will continue to update you about future opportunities for engagement on this very important discernment process. Easter Flower dedications: Last Chance! Parishioners and friends who would like to contribute Easter flowers in memory of loved ones or in thanksgiving for blessings in their lives, may do so by filling out the purple half sheet form found on the Welcome Table in the rear of church, and either placing it in the offering plate or sending it to the parish office. You can also do so online . Suggested minimum donation is $25 . For names to appear in the Easter Day bulletin, please respond to the parish office by Holy Monday, April 15 . (case sensitive). Space is limited, so sign up today! As many of you may have noticed, we now have a first aid kit and AED equipment across from the ADA bathroom and another AED Kit in the North Room. The Grace Church School also has a Kit outside of their office space above the Gym. Dr. Bryan McCarty has graciously agreed to do some training on this equipment for Sunday, April 28 at 10:15 am in the North Room . If you are interested in receiving training, please sign up at the back of the Church. Many thanks to Ellen and Lila Lovejoy for hosting Coffee Hour after the 11 am service this Sunday. "Walk in love as Christ loves us." 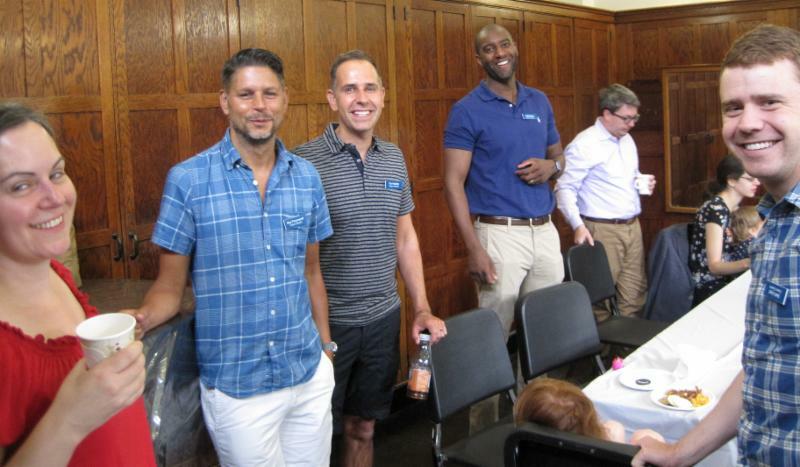 Each year Episcopal Ministries of Long Island seeks support for programs that serve the congregations and local communities of this Diocese, among them Camp DeWolfe and the Ali Forney Center. The 2019 Annual Appeal is now underway. For further information, please find information on the Welcome Table at the back of the church or visit the Episcopal Ministries web site . 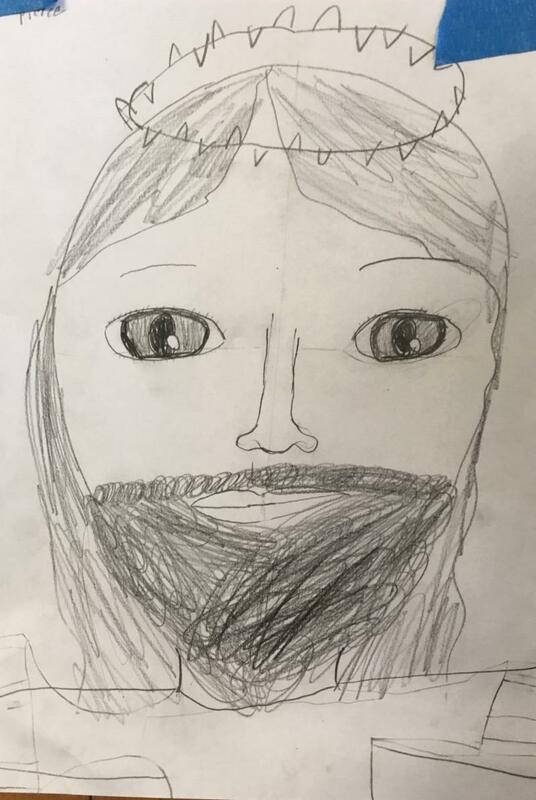 Parish Prayer Concerns: Wendy, Sybil, Jacob, Eric & Frances, Sandra, Bill, and Baby Daniel.